The second-generation Smart Fortwo Cabriolet Electric Drive completes a trio of pure-electric models from Mercedes-Benz’s increasingly relevant EV city car sub-brand, following on from the earlier Fortwo ED and Forfour ED, with which this new open-top shares its zero-emissions drivetrain. With a claimed range of just 96 miles, the compact two-seater will require you to forget about extended journeys or simple once-a-week recharging. But what it lacks in overall range, it more than makes up for in its sprightly performance and outright manoeuvrability in congested city streets. Power comes from a rear-mounted electric motor produced by Mercedes-Benz alliance partner Renault, which also uses it in the Zoe. In the Fortwo Cabriolet ED, the three-phase synchronous unit is tuned to deliver 81bhp and 118lb ft of torque. That's 5bhp and 22lb ft more than the Bosch motor used by the old Fortwo Cabriolet ED, but 7bhp and 44lb ft shy of the larger and heavier Zoe. The new motor is allied to an upgraded version of the lithium ion battery used by the first-generation Fortwo Cabriolet ED. It sits underneath the seats in a position that keeps the crucial centre of gravity low and ensures there is no loss of luggage space at the rear. Despite having the same 17.6kWh capacity as before, an improvement in energy density allows it to deliver an additional 10 miles of range. Smart also claims the recharging time of the revised battery has been halved, allowing you to charge it enough for nearly 100 miles of range in just 2.5 hours using the available fast-charge software. The Fortwo Cabriolet ED is a much more pleasant car to drive and spend time in than its predecessor. It’s also a more engaging proposition than its regular petrol-powered sister. Its larger dimensions give it a roomier interior - in fact, it's a considerable 110mm wider than before. The design of the dashboard is easier on the eye and the materials used inside are also of a higher quality. There’s also a fully integrated TomTom infotainment system with a 7.0in touchscreen, as well as larger door pockets and cubbyholes for better oddment storage. There’s a straightforward jump-in-and-go simplicity to driving the Fortwo Cabriolet Electric Drive that should win it appeal, both as private transport and on short-term lease schemes such as Mercedes-Benz’s own Car2Go. A new electronic management system provides finer throttle adjustment than with the old model. A good portion of torque is never far away; an earnest nudge on the accelerator gets the rear end settled on its springs and the nose raised, as the new electric motor propels the car down the road with a good turn of speed. The operation of the electric motor is terrifically smooth, quiet and seamless. 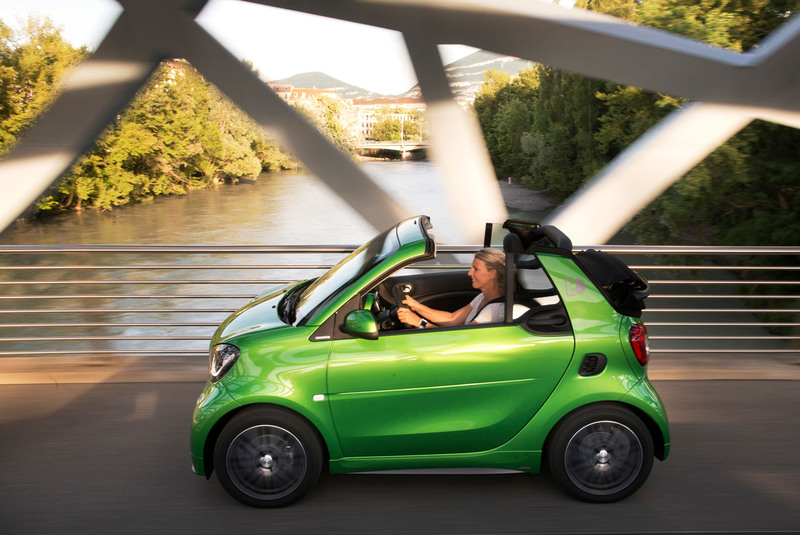 While not packed with power, it manages to provide the Fortwo Cabriolet ED with great response and strong acceleration from a standstill, making if a far more engaging choice than the petrol-powered version of the Smart open-top. The way it flings itself up to 40mph with all the vigour of a high-powered hot hatch is part-and-parcel of its appeal, providing it with nippy qualities, both away from the lights and on the run. Subjectively, it feels quicker than its official 0-62mph time of 11.8sec suggests. If you’re willing to forgo some of the performance for ultimate range, there’s Eco mode. Activated by a press of a button next to the gear selector within the centre console, it adjusts the mapping of the throttle, caps the power of the electric motor and limits top speed. There’s also a braking effect on a trailing throttle as electric energy is recuperated on the overrun and stored in the battery. This employs a clever radar sensor to provide anticipatory operation, continuously monitoring the traffic conditions and setting the energy recuperation level as well as the amount of braking effect as is fit. 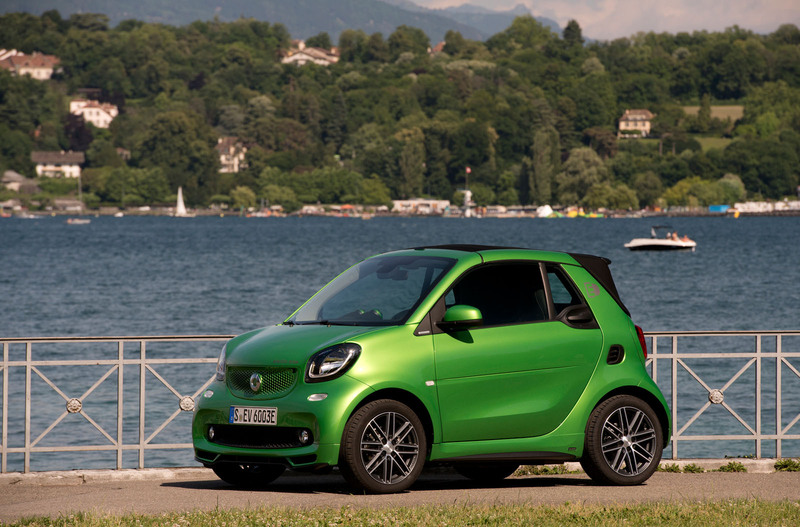 Having its battery low down gives the Fortwo Cabriolet ED a lower centre of gravity than its petrol-engine siblings. It also has firmer springs and dampers. As a result, its body movements are better controlled and its ride is more settled, particularly at lower speeds, although the steering is exceedingly light and lacking in any real feedback. Overall, it feels more mature to drive than its predecessor, with greater compliance within the chassis and improved rolling refinement. The clincher, though, is its overall manoeuvrability, which really has to be sampled to be believed. With a length of just 2695mm and the smallest turning circle of any current series production car at 6.95m, the Fortwo Cabriolet ED runs rings around all of its rivals for sheer agility in a city driving environment. Further appeal comes with the automatically operated cloth roof. It retracts back and stows in a position above the luggage compartment at the press of a button. For true open-top motoring, the header rails can also be detached. Some will see the Fortwo Cabriolet ED as nothing more than a modern-day mobility device with a rather limited range. But it is more than that – much more. Along with its fixed-roof sibling, in some ways it is the ultimate city car – one that grows on you the more you live with it in an urban environment. With strong performance up to typical city speed limits and unparalleled manoeuvrability within tight confines, it is a city dweller‘s dream. The downsides are that use of it requires easy access to an electricity supply for recharging, and that it can only seat two and take a limited amount of luggage. If you can live with this, it's the clear choice over the petrol-engined Fortwo Cabriolet, which lacks the sheer verve and inherent character of its new electric-powered sibling. ..the price as it is so often with Smarts. Other than that and the limited range (be good to have an bigger battery option) it does has a certain charm. Must be a bit weird driving an EV convertible, I think this is the first??? Not the first, how about the original Tesla Roadster? I find washing my car harder than charging it.. I live in greater London and run an EV and have no issue charging, there are plenty of charge points about and although I have no off-street parking its quite easy to run a cable from my house to the car (I use a trip mat for the payment) and pulling a lower amperage is ok you just plan your refills accordingly. The new lamp post charge points by Ubitricity should bring a quicker and cheaper roll out if local councils get on board. The biggest annoyance will be the amount of room, in an already small boot, the charge cables will take up..
On the subject of the Roadster/EV Convertibles it's deliciously weird listening to the birds tweet and wind rustling through the trees as you zap along a country lane or two..
How this Go-cart rates a four star is beyond my comprehension. Who charges once a week? If you're going to get an EV you'll make sure you can charge it. If so 70 miles of range is pretty reasonable for a city car.